Wales is often described as the land of song, but I prefer to see it as wider than that, and call it the land of culture. This can be seen in all walks of life, and in many different ways. The above painting of various scenes in and around Penycae was done by John Davies, who has lived in the village all of his life. He was affectionately known as "Johnny Paraffin" (Wales does like its nicknames), as for as long as I can remember he drove a van around the village and surrounding area to deliver paraffin and a variety of household goods. He could talk for Wales on any subject, and never seemed to be in a hurry to get to the next customer. He was also a leader at Zion English Baptist Chapel (which I've mentioned before), and I shall be eternally grateful for the help and support he gave to me in my early development. 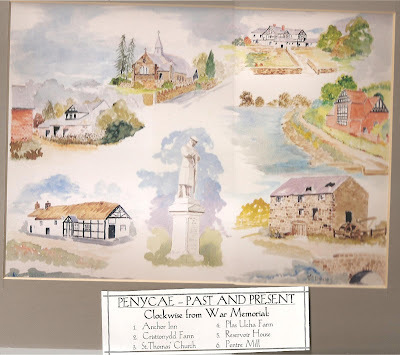 He is now part of Penycae Art Club, which shows how important it is to document the life and history of a village, whether in painting, prose, poetry or song, while people are still alive. 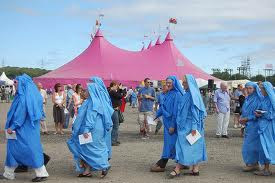 The culture of Wales is very much kept alive through the Eisteddfodau (singular is Eisteddfod) held every year. There are two main ones: The Royal National Eisteddfod of Wales (very much Welsh language), and the Llangollen International Eisteddfod (promoting culture from across the world). In 1961 I was part of the National Eisteddfod when it came to my area, but more of that later. I'll also mention the International Eisteddfod, and its relation to the village in another blog. The word Eisteddfod literally means 'eistedd' (to sit), and 'fod' (to be), so its historic meaning is The Sitting. I believe that this refers to the early days when 'judges' sat in a circle with the performers in the middle. The National Eisteddfod is the home of literature, music, dance, recitation, theatre, visual arts, science and technology, and all types of culture in Wales. Its purpose is to encourage the preservation of Welsh music and literature, and only those who sing or write in Welsh may enter the competitions. Eisteddfodau have been in existence for hundreds of years. It is believed that the first Eisteddfod was held in Cardigan Castle in 1176. Records then show Carmarthen in 1451; Caerwys in 1568, and Corwen in 1789, which was the first time that the public were admitted. The modern National Eisteddfod is very much from the 19th Century, and I have a theory as to what was one of the driving forces for change. The Government (in London) commissioned a report which had the title, "Reports of the Commissioners of Enquiry into the State of Education in Wales", which was published in 1847. The commissioners visited every part of Wales in 1846 gathering evidence and statistics. One of the problems, though, was that none of them spoke Welsh, and teachers and children did not speak English. The commissioners relied on information from witnesses, many of which were Anglican clergymen, at a time when Wales was a stronghold of Nonconformism. The report was not complimentary, and was not helped by a conclusion which said that " the Welsh were ignorant, lazy and immoral, and that among the causes of this were the use of the Welsh language and nonconformity". 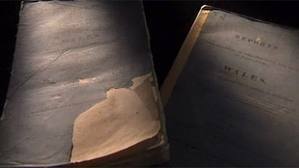 The report was presented to Parliament on the 1st July 1847 in three large blue-covered volumes, which resulted in a furious reaction. In Wales, the report was given the name, "The Treachery of the Blue Books". Robert Jones Derfyl, a Bard, wrote a book-length response, which some historians say was instrumental in the genesis of the modern Welsh self-government movement. The general public felt that the report was an attack on the character of the Welsh as a nation, and the belief grew that it was important for the Welsh to create a new national image. In the 1850's people were talking of a national eisteddfod to showcase Wales' culture. One was held in Llangollen in 1858, and only three years later, in 1861 the modern, annual National Eisteddfod of Wales was born. 2011 marks the 150th anniversary of that date, and this years Eisteddfod is being held in Wrexham, just 5 miles away from my village, my home. According to tradition, the intention to stage an Eisteddfod must be announced at least one year and a day before the actual event. On the 3rd July 2010, this is what happened in Wrexham. A procession of over 1200 people marched through the town centre, concluding with the proclamation ceremony. At the heart of every National Eisteddfod are the Bards and the Gorsedd. Bards go back hundreds of years, and in their simplest form are poets and musicians, many of whom were professional, in that they were employed in the service of some Lord. The Gorsedd is a community or coming together of modern-day Bards. 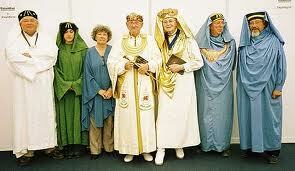 They hold the right of proclamation and of governance, while the Eisteddfod Council organises the event. There are three ranks of membership in the Welsh Gorsedd. There are three Gorsedd ceremonies at every Eisteddfod, which happen at the end of the three main competitions. A new bardic chair is specially designed and made for each Eisteddfod, and is awarded to the prize-winning Bard each year. When I was 13, in 1961, the National Eisteddfod came to Rhosllannerchrugog (the Rhos) just one and a half mile from Penycae. With a population of around 10,000 people, it was one of the largest villages in Wales. Because of its built up nature, the Eisteddfod was held on the outskirts of the village on the fields of Rhosymedre. I was attending Rhos Secondary School at the time, and somehow we entered a group in the Choral Speaking competition, and I was a member. Choral Speaking, for those unfamiliar with it, is projecting your voice and speaking in chorus. Imagine the finest choir. Take away the music and the singing, and just speak the words. I have always loved this form of art, and when done at best, it is powerful, evocative, intense and very moving. I have looked up some choral speaking on the Internet, but to be honest they were mostly rubbish, and I refuse to give a link in case you become tainted. I have no idea how we did in the competition, but as I had by then begun to love public speaking, I'm sure that performing on stage in front of thousands was a magical experience. I think that Marcus Garvey is right, "A people without the knowledge of their past history, origin and culture is like a tree without roots".